I have made strudel before, but it was back when I was a freshman in high school and doing a project on Austria, including a meal with traditional food. I remember thinking the sachertorte was far tastier than the strudel with its dense dough. I have suspected for a long time that I simply did not handle the dough appropriately, and was excited to see this challenge. 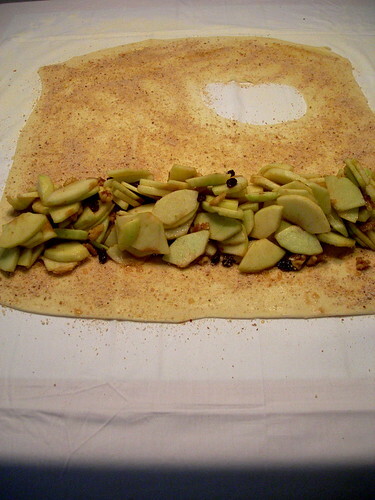 I knew from the beginning that I wanted to make two batches of strudel after seeing a recipe for Curried Fruit Strudel in G - The Magazine of Greenville, the May/June issue. The hosts also said it might take more than one batch to get the hang of stretching the dough to a thinness of tissue paper. They were right! I ended up with a huge tear in my first batch that no patching would repair. I decided to go ahead and use it as it was with the original apple, raisin, and walnut mixture. The only change I made was substituting vanilla for rum, not that I'm against rum, but it was Sunday of Memorial Day weekend and I knew I had two days where I couldn't buy any, and didn't want to wait. As you can see, the bread crumbs are prominent on this dough. I didn't like how much you could see and taste them in between the layers without filling, so decided that the next time I would only sprinkle them on the areas of the dough that would have direct contact with the filling. The end result was pretty good. Something about the dough made Nathaniel think of pizza, and while I didn't get that exactly, the breadcrumbs made me unhappy. Okay, okay, I admit it! I bought pre-made breadcrumbs! Maybe if I had made my own they would have been softer and more buttery, less like sawdust. Live and learn. 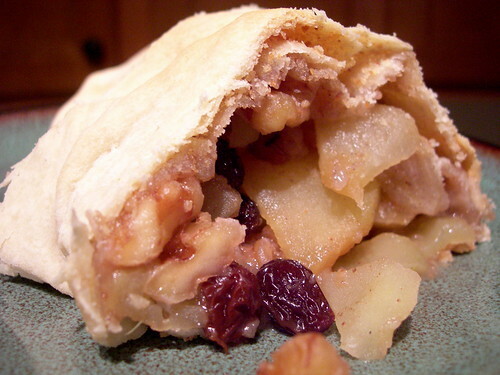 You can find the recipe for the original apple strudel at either host's site, as well as the recipe for the dough. 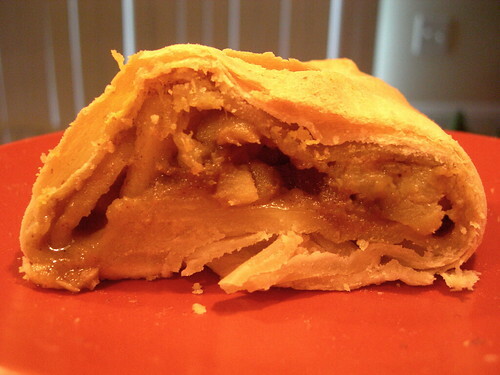 What follows is the recipe I made, adapted from the recipe found in G Magazine for curried fruit strudel. Heat 3 tbsp butter, sugar, curry powder, and cinnamon in a large pan on medium-high heat. Add apples and pears, stirring to soften. Remove from heat and stir in bananas, almonds, and tropical fruit. 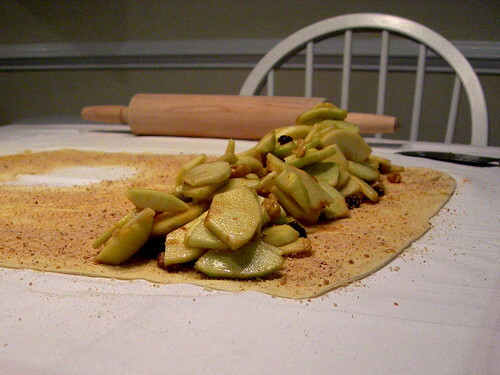 Use as filling in your favorite strudel dough, or use phyllo dough as a shortcut. Brush with butter and bake at 400 for 30 minutes or until browned. The second time around, the dough was much more successful - only tiny tears, it rolled and stretched out more evenly, and I would not hesitate to try making another strudel another way. I thought the curried fruit combination was really interesting - sweet, spicy and delicious. I almost left the bananas out but they were really good with the curry. The dried tropical fruit was a last minute inspiration as I stared at the dried fruit section of the grocery store, and I thought it was a good way to include the flavors of those fruits without the water their fresh counterparts would contain! The change of only putting breadcrumbs on dough directly touching the filling made a big difference in the taste and texture of the final dessert, and I would recommend making this change in the future. I sometimes go to YouTube for inspiration on baking technique, and came across this wonderful baker in Vienna, taped by a tourist, at an event that I can only imagine was created for tourists to begin with. Baking can be entertainment! 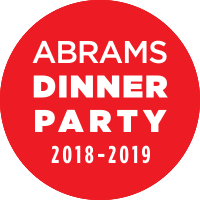 You may access my other Daring Bakers challenges here, or check out what the other bakers have done through The Daring Kitchen. We stopped by Baked in Charleston, SC, on our way back home from a cruise. I'd been looking forward to it because I have this way of idolizing New York City bakeries and was excited when I learned this particular Brooklyn institution decided to open in Charleston as well. The first thing I noticed when we walked in was the number of people sitting outside on their laptops, an even bigger mystery when you realize how much seating is available inside and how humid it already was outside. I love the space they have, and they have a good location downtown. The second thing we noticed is that they take up more space selling merchandise than baked goods - an entire wall of t-shirts, cookbooks, and other paraphernalia; while some of the baked good selection was on the slimmer side. To be fair, it was already 10:30 AM on the Saturday of Memorial Day weekend and the start of the Spoleto Festival, and they might have been a bit cleaned out. Since it was morning and we had iced mochas from Metto Coffee (in Mt. Pleasant, where we always stay), I got a scone, but then wanted to try one of their cupcakes since they sell a lot of cakes and cupcakes. 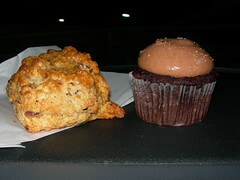 The scone was okay, a little on the dry side despite the glaze, although the pecans inside were delicious. The cupcake wasn't the best texture (a little dry), and while I don't want to use this particular bakery review to rail against a trend I hate that is going on in baking right now, I might as well take the opportunity. When candy makers started adding sea salt to caramels, I was into it. The super sweetness of a caramel has an incredible depth added to it with a little sprinkle of salt. Everything else just tastes SALTY. Quit it! I think almost everyone would get something tasty at Baked in Charleston. The biggest hurdle with me was the sneaking suspicion that everything was similar to my baking style, but that I felt my versions were a little better. I can't fault them for having my taste though, and think you will enjoy it. I love how there is space to sit and enjoy their goods or the company of others, and it isn't just a walk-in/walk-out bakery. I hope they do succeed in their venture outside of NYC, and will keep following them on Twitter to cheer them on. I just had friends here from Oregon, and wanted to cook a southern dessert. Red velvet cake seemed too heavy, and I got great suggestions like pecan pie and sweet potato pie, but then I started thinking about banana pudding. Banana pudding is the quintessential southern dessert, particularly when one is having collards, grits, and pork from Henry's Smokehouse like I was planning. But I couldn't just make banana pudding! Luckily I recently checked out the Soby's New South Cuisine cookbook from the library and found this gem, the white chocolate banana cream pie. According to the book, it has been their top selling dessert since they opened in 1997. Soby's is one of our favorite restaurants in Greenville, in a beautiful building downtown. They always have good service and excellently prepared food, but it does tend to be busy (and louder). This dessert seemed like a classier take on banana pudding or banana cream pie (because actually this is a tart), so I decided to give it a shot. This is typical of restaurant recipes because so much of it can be made ahead of time. I made the crust and pastry cream two days in advance, so the night we ate, I only had to whip the cream, slice bananas, and mix a few things together. This was sweet, pillowy, and delicious. The banana flavor was prominent, and the vanilla flecks throughout were pretty. For the tart shell: Place the flour and sugar in the bowl of an electric mixer fitted with the paddle attachment. On low speed, add half the cold butter and mix for 30 seconds, then add the remaining butter. Continue to mix until all the butter is cut into the flour and the mix resembles sand. Lightly beat together the egg and vanilla in a small bowl and add it to the flour and butter. Continue to mix until a dough ball is formed. If the dough does not form a ball after 1 minute, add a few drops of water. Remove the dough from the mixer. Wrap in plastic wrap and chill. 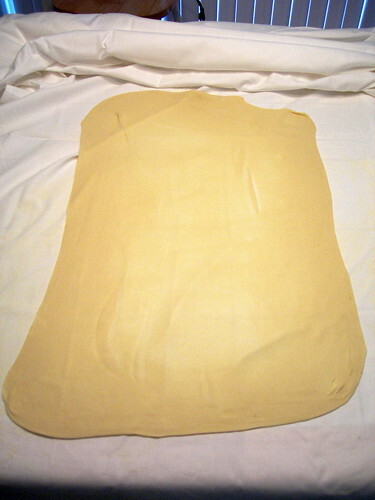 Preheat the oven to 350 F. Have ready an 11-inch removable-bottom tart mold. On a floured surface, roll out the dough into a 1/8-inch thick circle large enough to fit the mold. Press the dough into the tart mold. Refrigerate for 10 minutes. Bake the crust for 16-18 minutes or until it is golden brown and crisp. For the pastry cream: Pour the milk into a heavy bottom 2-qt saucepan. Split the vanilla bean in half lengthwise and scrape out the seeds with the back of a small knife. 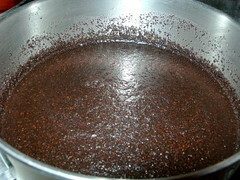 Add the seeds and pod halves to the milk. Heat the milk until it is about to boil. While the milk is heating, whisk together the cornstarch, sugar, salt, and eggs until smooth. Tempter the egg mixture with one-quarter of the hot milk and then add it back to the pan. Whisk to combine. Continue to cook on medium heat stirring constantly. When the custard thickens, remove it from the heat and whisk in the white chocolate. Pour the pastry cream into a container and place a sheet of plastic wrap directly on top of the cream so no skin forms. Refrigerate until completely cool. For the pie: Whip the heavy cream until soft peaks form. Add the sugar and creme de banana and whip to very stiff peaks. Place the cold pastry cream into another bowl and soften by mixing it with a rubber spatula. Slice the bananas into the pastry cream and stir to combine. Fold in the whipped cream. Mound the filling in the middle of the tart shell and smooth it down to the edge. Carefully cut the pie into 8 or 10 slices before garnishing. 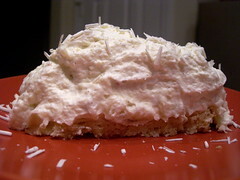 Using a vegetable peeler, shave enough white chocolate curls to cover the pastry cream. Dust the top with cocoa powder. Serve immediately or refrigerate. There is a little Vietnamese place that I love to go to in Greenville called Pho Noodleville. Granted, the service is always, always terrible. Not just bad - terrible. And the chairs are super uncomfortable. But there are rarely many people there (possibly a bad sign) and if you have a lot of time and patience, I think the food is worth it. It is sometimes hard to find good vegetarian food in the south, and they have enough options that I have not yet tried everything. My favorite are the tofu dishes which are well seasoned and filling, and are served with rice that I hope is intentionally greenish. My actual secret, however, is that I really go there for the coffee. The most recent waiter we've had makes fun of me for ordering it because it isn't served with dinner in "his country" (aka Vietnam), and I often have to get it to go because it really does take that long to brew or he forgets until we are ready to pay. The jury is still out on that one. But I realized that they were simply using coffee from Cafe du Monde in New Orleans, which is technically coffee with chicory. They brew it in individual servings, into a cup that already has condensed milk in it. Once it is brewed and stirred together, it is served over ice. Words can't begin to explain how good it is. 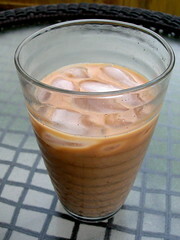 This idea of iced coffee is not unique to the Vietnamese, of course. A trip to Saigon Market, also in Greenville, gave me an opportunity to buy a bottle of coffee concentrate from Cofe Thai, which is what they use at Thaicoon Ricefire and Sushi Bar, the Thai restaurant closest to the campus where I work. When we were in Jamaica, we bought some of the famous Blue Mountain Coffee. The place where we bought it sold it black or with condensed milk (surprise surprise!). So even hot, this combination of coffee with condensed milk was nothing new. 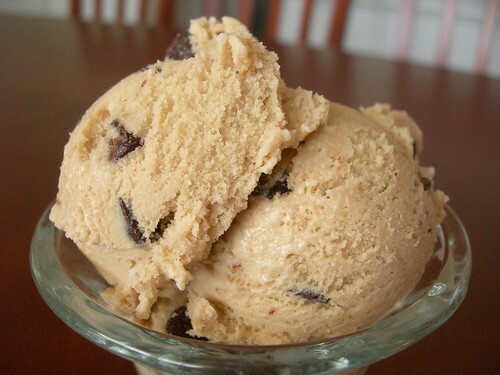 I have mentioned Perfect Scoop by David Lebovitz before, but when I saw his recipe for Vietnamese Iced Coffee Ice Cream, I felt like I had stumbled across a kindred spirit. I adapted the recipe to make Jamaican Blue Mountain Coffee instead, and added chocolate chips. It used a different technique, and much of the dairy in the recipe is actually condensed milk, true to the original. In all of my iced coffee experiments, I came across the recipe for cold-brewed iced coffee, in the New York Times, blogged about and photographed beautifully by Smitten Kitchen. Since I had all these coffees floating around, of course I had to try it! The mixture ahead of time does not look very encouraging. But you simply stir together ground coffee with water, let it sit on the counter covered for twelve hours (or more, as I discovered), and then strain it a few times. Voila - your own coffee concentrate. For true iced coffee, you would add ice and water to the cool concentrate, but I prefer to use milk, meaning soymilk, and 1-2 splenda packets. I feel like I have saved so much money that would normally go to Starbucks or local coffee shops by making my own iced coffee! I realize it isn't an iced latte, and this is not espresso, but if you have coffee that is high quality like the Jamaican Blue, or interesting enough in flavor like the coffee with chicory, you just can't go wrong. I was told by a lovely online friend from Wish I Were Baking that the reason this works is caffeine is water soluble, and the bitter taste in coffee is from the oils, which require heat. Cold brewing coffee should always make for a mellow, flavorful taste. And I really thought it did! 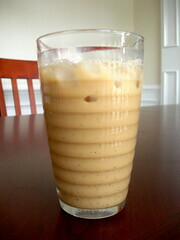 Enough where I went a little outside the baking realm to wax poetic, all about iced coffee. Now that we are headed into summer, if you give it a try, let me know what you think! Thanks to the NY Times and Smitten Kitchen for doing it first, and to David Lebovitz for his inspiring ice creams. Strawberries are in season so much earlier in South Carolina than they were where I grew up in Oregon. I have actually missed it before, but not this year. 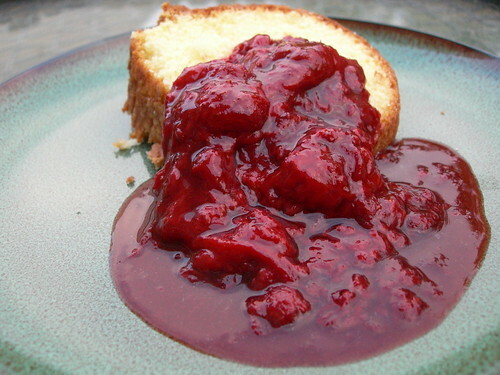 This has been a great year for local berries, and I have been experimenting with new ideas and recipes. Since I created a Twitter account just for baking, I have had a window into the daily lives of other bakers with Twitter accounts. When @glamah of Coco Cooks posted that she was roasting strawberries, I eagerly asked for the method, which she gracefully shared. It is a simple method, but I just hadn't ever thought of roasting strawberries. 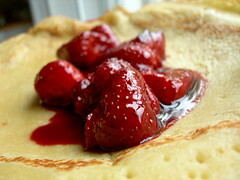 She hulls them, sprinkles with sugar, drizzles with balsamic, tosses the berries and cooks until soft and carmelized. Balsamic and strawberries, if you haven't ever tried it, has this amazing result of not tasting vinegary but bringing out the flavor of the strawberry even more. Of the various toppings I'd prepared for crepes, this was by far the best. I liked the flavor so much that when I made Nick Malgieri's Lemon Ginger Pound Cake (from The Modern Baker), I knew it deserved an awesome sauce. My youngest sister is always adding the word sauce at the end of various words, so as a tribute to her, the roasted strawberries mashed up became known as Awesomesauce. The cake by itself was flavorful, and the strawberry was a lovely pairing with the lemon and ginger. I brought it in for my student workers and anyone else passing through the music library, because it is finals week and sugar is essential.